Rose is one character we haven't heard much about since J.J. Abrams began shooting the epic finale to the SkyWalker saga this summer. Small tidbits have dribbled out here and there. Rose has been a divisive character, to say the least. Fairly new to this universe, she has some fans, but more haters. And the abuse online towards the maintenance worker caused the actress who plays her, Kelly Marie Tran, to quit social media. Now, she'll be back in Star Wars 9, presumably still pinning away for Finn after she saved him from his suicide mission at the end of The Last Jedi. Finn clearly has feelings for Rey, so there will be an interesting dynamic that plays out amongst the three of them, especially between Rey and Rose. Rey has been paired up with quite a few Star Wars characters in just her first two movies. She ran with Finn and BB-8 on Jakku, flew the Millennium Falcon to Maz Kanata's Castle with Han Solo, broke away for her own solo mission inside the Starkiller Base, took Chewbacca and R2D2 to visit Luke Skywalker, and spent some special alone time with Kylo Ren in a series of Force FaceTime sessions, before teaming up with the new Supreme Leader to take on Snoke's guards. When last we say Rey, she was meeting Poe for the first time as the last of the Resistance flew to the far reaches of the galaxy inside the Falcon. "I heard that the movie will follow 3 plot lines: Poe and Finn in a mission, second plot line would follow Rey and Rose going in a [sic] 'adventure' of some sorts, and the last plot line would be from Kylo's perspective. Trying to keep the [First Order] in line and fulfill his plans." This Reddit user doesn't want to go as far as to confirm these things. And the person that leaked the info only has a small job on the production side of it. This sounds right, though. We can confirm that Finn, Poe and Chewbacca are off visiting the grass plains of an unnamed planet. Early set photos showed these three characters teaming up. The images were said to be from the first act of the movie. General Leia has allegedly sent various soldiers into the wild searching for new recruits as the Resistance attempts to build a defense against the First Order and destroy them for good. The most interesting arc here, that no one has really been talking about, is that the Resistance is being led by the mother of the guy now in control of the First Order. They are both supremely force sensitive. Hell, Leia can fly through the cold vastness of space with just her fingers guiding the way. This conflict was supposed to fuel the main story in Star Wars 9, and there were two key scenes between Kylo and Leia that didn't get shot before Carrie Fisher's passing. This story between mother and son has been scaled back, and J.J. Abrams is using old discarded footage from The Force Awakens and The Last Jedi to cull together a performance from Carrie Fisher. While the iconic actress is not being CGI'd, its suspected that everything around her, including her wardrobe and perhaps even her mouth for new dialogue, will be manipulated. There is no word on what Rey and Rose will be doing together. It's expected that they will also be off in the Outer Rim, searching for recruits. We've already seen a set photo released by J.J. Abrams that has Finn, Rey and Chewbacca on the Falcon, so everyone will regroup before the third act. Star Wars 9 is expected to kick off with a substantial time jump. Everyone will be older and wiser. Some time will have passed between Rose and Finn, so perhaps they've worked out some of their relationship issues. 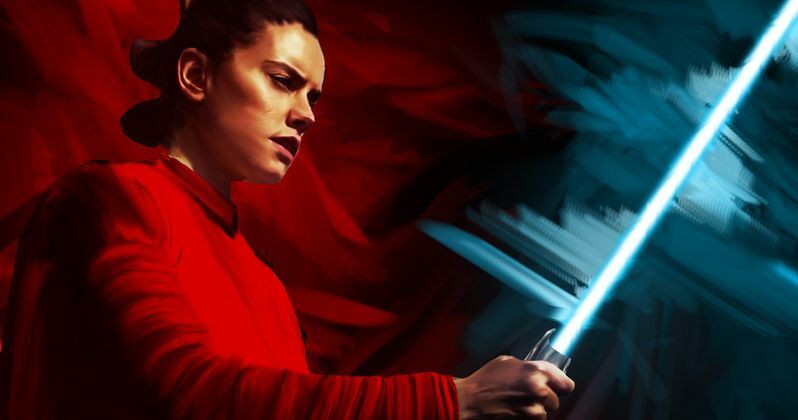 The story in Star Wars 9 will most likely be given over to Kylo and Rey, but where there paths will lead is anyone's guess but J.J. Abrams and the crew at this point. This latest Star Wars 9 intel came from a so-called secret spy on Reddit. The art used above was created by Izac Peters.